Michelle & Brandon are Fun In The Sun Weddings’ newest newlyweds! This bride and groom provide the perfect example of why we love doing what we do. They totally enjoyed their wedding day, staying carefree and relaxed, and the result is absolutely magical wedding photos! Michelle and Brandon met while working together at a bar in Burlington, Ontario. Michelle, the bartender, called dibbs the first time she laid eyes on the new bouncer, Brandon. It was at a party after work one night that Michelle weaved a little magic to be alone with him, and the rest is history! 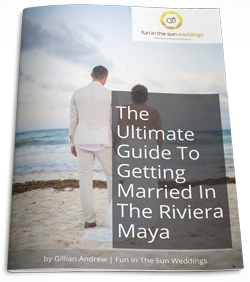 This bride and groom had a very short engagement and immediately jumped on planning their destination wedding in Riviera Maya at the Riu Cancun because they both love being outdoors in the sun. We thought how amazing it would be to get married in the sand in our bare feet. Plus, what a great excuse for us and all of the people we love to go on an amazing vacation together! Michelle went shopping for beach wedding dresses with her mom and did not have any idea what she was looking for. But the second she tried on her dress, straight from the rack, she knew it was the one. Simple, but with a touch of sparkle. Perfect for the beach! 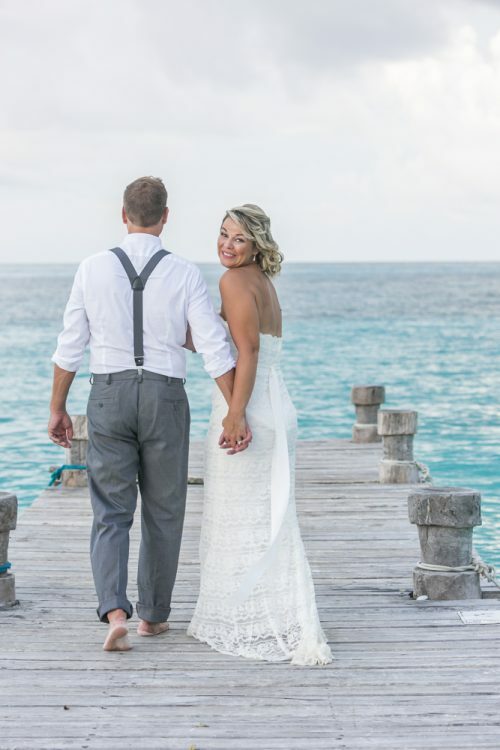 Rarely does a wedding day go off without a hitch, and this bride and groom’s hiccup came when their resort informed them that due to capacity, their hair and makeup team would not be allowed on site! But Beso Brides were just amazing every step of the way. 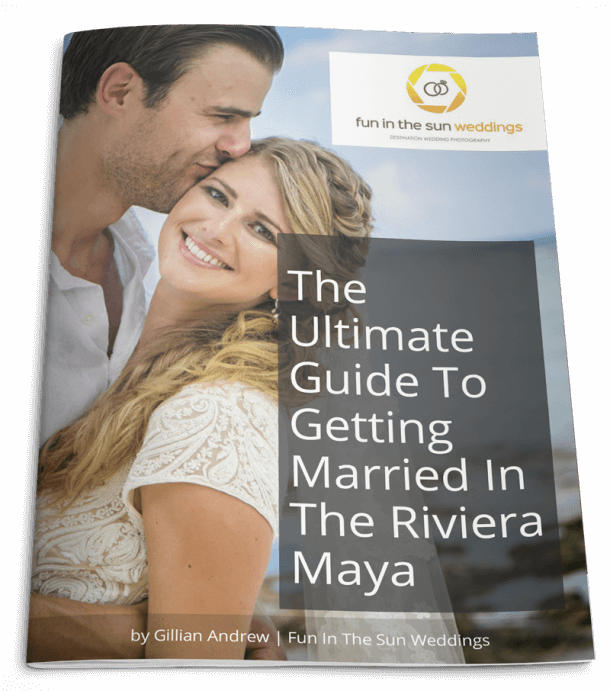 Even when they did arrive and were told they could only stay for three hours, Michael and Martina said they would get everyone glammed up and beach makeup ready, even if it meant finishing them in the lobby! What are Michelle’s tips for all the Brides-to-Be getting married on the beach? 1. If your wedding planner tells you that you do not need a rehearsal, at least make sure you know which path you should follow to walk down the aisle, as well as which bridesmaid will walk first! 2. Pack something for wrinkle release, just in case. 3. Most importantly, don’t let the small stuff get you down even it feels the most important. Things will happen, but that’s where great stories come from. Michelle & Brandon, we wish you all the best in this next chapter of your lives together. We know that you have an exciting road ahead of you, and thank you for the opportunity to capture this special moment in time for you. 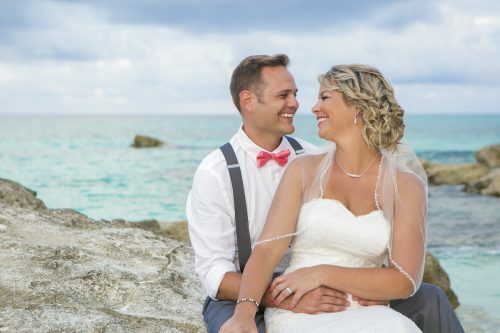 If you are looking for the best Cancun wedding photographers for your beach wedding then contact us today! We are Fun in the Sun Weddings, the best wedding photographers in the Riviera Maya, Mexico. Want to know more about the Riu Cancun? Read unbiased reviews from Tripadvisor here. Marc and Gillian are both AMAZING! It was the name that originally got my attention, from the very first email, you know that you are good in hands, with the polite and quick responses. Marc has an incredible talent and really makes you feel comfortable and ensures you are having FUN on your big day - you can feel is excitement from the moment he walks in! I just received my photos back - and all I can say is WOW - I LOVE LOVE LOVE them. There are so many beautiful moments and fantastic facial expressions captured naturally - looking through them brings me back to that special day. I STRONGLY recommend Fun in The Sun for the most amazing experience!